The world of interface design has gradually shifted from a design focus to a user focus. This means designers now care more about the experience rather than how something looks. You can design pretty websites all day but you need great UX to create a usable website. Granted UX is just one part of design, so you should study many areas. But if you’re getting more into the UX side of things you’ll love these YouTube channels. They feature free content that goes beyond just typical UX work into all sorts of topics relevant to freelance and in-house designers. 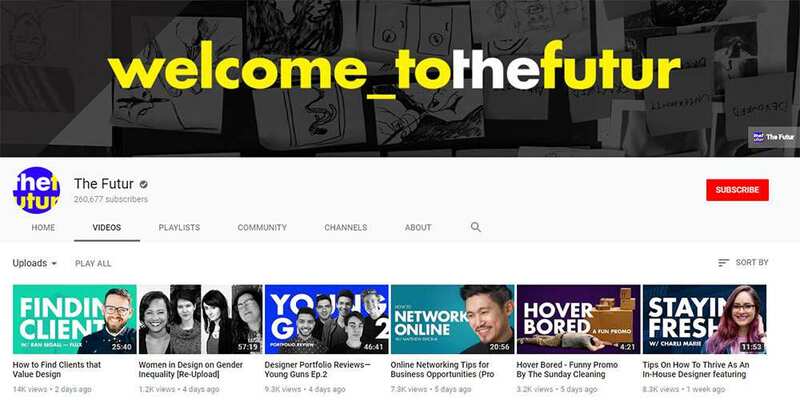 When it comes to user experience design on YouTube there is no better channel than The Futur. It is jam packed with advice, design reviews, and guidance for aspiring designers. Not to mention plenty of videos to get your creative juices flowing. There’s actually a lot of practical videos on this channel with advice on how to keep your business relationships strong, how to land your first, job, and the process of developing soft skills for a team environment. The future is UX and The Futur is your classroom. 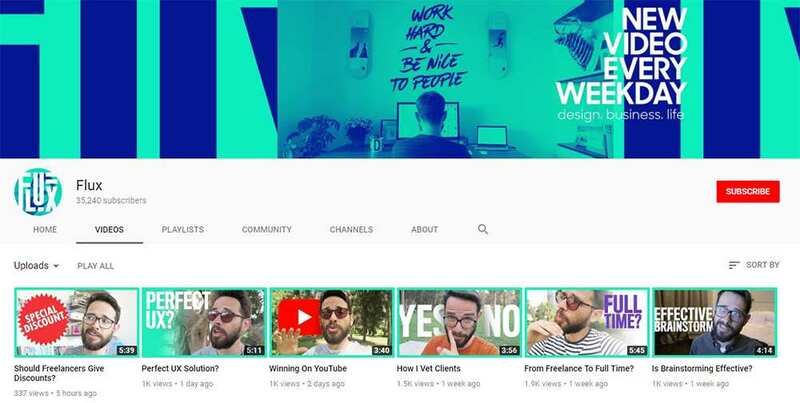 UX designer Mike Locke runs his own YouTube channel with real success. As of this writing he has about 70k subscribers, and the channel is growing larger every month. Content mostly relates to UX in the real world with practical ideas for aspiring designers. You’ll find plenty of informational videos on how to overcome creative block and how to keep learning while on the job. But there are sporadic tutorial videos on software like Sketch that should prove invaluable too. No matter where you are in your design journey this is a channel worth checking out. With fresh new videos Monday-Friday every single week of every month, there’s no denying Flux is a brilliant channel for UX design. It features a new video every weekday, so you’re guaranteed lots of new content per month. It acts like a vlog for UX designer Ran Segall as he shares tips and advice on the design world. He also posts some personal videos about his work and his career which can be valuable to watch if you’re just getting started. In the end, you may get attached to Ran’s videos and find yourself refreshing YouTube daily waiting for the next release. 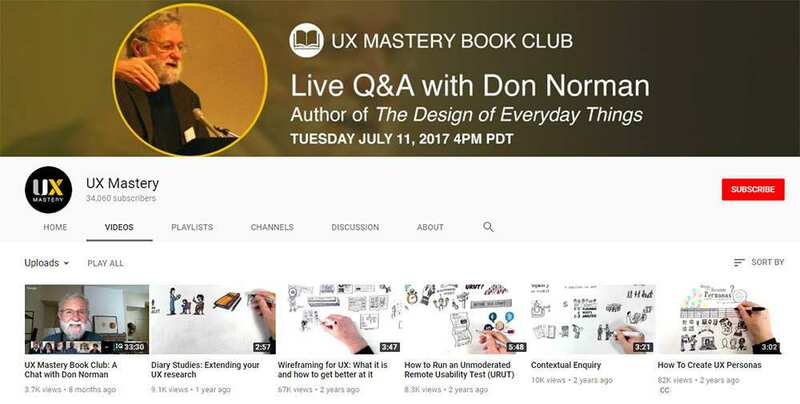 Among dozens of UI/UX channels on YouTube, very few compare to UX Mastery. Unfortunately this channel does not update very often anymore so you may not feel that subscribing is worth the effort. But I absolutely recommend browsing their videos page and bookmarking that link for future reference. There’s bundles of tutorials and guided videos from UX pros who share pragmatic advice you can apply to your design career. Granted the library is small, and there aren’t many updates, but the content quality more than makes up for that. 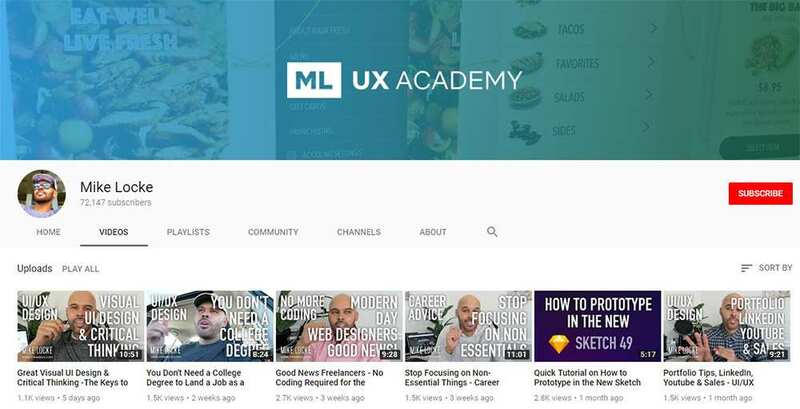 This is perhaps the single best YouTube channel with UI/UX tutorials on the web. Simply titled Dansky, this channel covers all the major UX software from Sketch to Adobe After Effects and Principle. There’s also a bunch of Adobe XD tutorials if you’re an early adopter there. Videos range from 5 minute quick tips up to 60-90 minutes for multipart tutorials. This channel deserves a sub if you’re actively practicing to improve your UX skills. There’s new content weekly, and you’ll never be disappointed by the quality. I’ve used Sketch a handful of times and it really is a nice choice for MacOS users. It’s also one of the best programs for UX designers since you can wireframe, mockup, and prototype all in the same software. 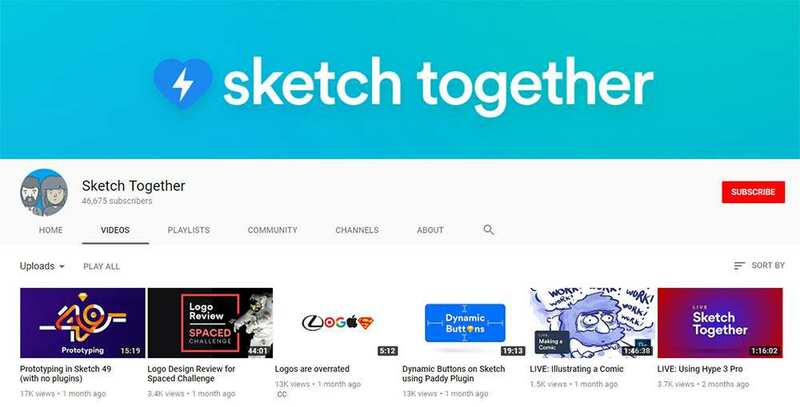 If you wanna learn Sketch then I absolutely recommend the Sketch Together YouTube channel. This is technically a channel covering all things user experience, but there is a lot of Sketch content as well. If you run Sketch in your daily routine you better slap that red “subscribe” button before you forget. So Neuron UX is a really small channel. It has less than 1000 subscribers and only 25 videos in total. But the videos are practical and cover a lot of interesting topics on UX design. They’re also pretty short making it super easy to consume videos without dedicating a bunch of time out of your day. There’s even content here for pro designers with lots of topics on heuristics, freelancing, and even a guided tutorial on how to architect a simple UX from scratch. I wouldn’t subscribe here unless the channel starts updating with new content soon. But I would bookmark the page and check out some of these videos as you study UX elsewhere. Tutvid is pretty massive and it has a ton of great tutorials. Only problem is that this channel doesn’t focus exclusively on user experience content. Still I really think it belongs in this list for the many high quality tutorials you can find. There’s a lot of lengthy tuts from 30-60+ minutes on all the major Adobe software. UX designers often rely on Photoshop for design, After Effects for animation, and XD for wireframing. All three get plenty of coverage along with a few other programs too. This channel is bound to have some tutorials that’ll teach you a lot of practical techniques for UX work. It’s definitely worth a quick look to see what you think. So the Caler Edwards channel is another example of solid free design tutorials catering towards user experience. Easily accessible and totally free, these videos are the perfect resource for newer UX designers. Most tutorials span two videos, and they total around 30-60 minutes total. There’s plenty here to go through with a focus on Adobe XD, ProtoPie, Principle, and lots of Photoshop. This is strictly a UI/UX channel, so each tutorial covers something related to web or mobile design. Absolutely worth a sub in my book. I just recently found Laith Wallace’s channel and it seems pretty new. He’s got around 10k subscribers and just over 25 total videos. Some of those date back over a year and others were published within the last month(as of this writing). Uploads are sporadic, so there isn’t any clear schedule for content. But Laith is an excellent speaker and teacher, not to mention very motivational. These videos are one-part educational and one-part inspiring to keep you forging ahead with UX design, even when you’re feeling confused or just downright lost. Granted all of the channels in this list are worth checking out, but they each offer a different perspective on user experience design. Take another look at this collection and be sure to subscribe to anything you’d want to revisit sometime.